One of the hot topics in the university sector is the impact of Massive Online Open Courses (MOOCs), which are online courses aiming at large-scale interactive participation and open access via the web. I think MOOCs are great way for people who are considering further study to ‘try before they buy’ through studying part of a subject, so late last year we offered our first MOOC on Windows Phone 8. We had a fantastic response with over 500 students enrolling, and so we have decided to offer a series of MOOCs throughout the rest of the year. If you want to get the world’s best people to design, develop and run subjects based on Microsoft technologies, the Microsoft Most Valuable Professionals (MVPs) would be first on my list. A number of MVPs have already volunteered to help us as assistant Doctoral Supervisors for Doctor of IT students wanting to research Microsoft platforms, and we are excited to announce that three MVPs are joining us this year as lecturers. With monthly free short courses on offer it’s going to be an action-packed year. As mentioned above, late last year we ran our first MOOC on Developing Apps for Windows Phone 8. Even though the course is finished, you can still access the materials and complete the course of study at your own pace, as we have made the material available here. The next MOOC we are offering is pretty exciting, as we think it is the first time that a MOOC has been offered on an IT Doctorate. Studying a Doctorate is a big commitment so we are offering this short course on Research Methodologies so that you can get a feel whether you are ready to take the plunge into one. Starts on the 18th of April, click here to find out more and reserve your place. Demand for SharePoint Developers is booming and in May SharePoint Server MVP Brian Farnhill will be running a MOOC based on our new ITE510 SharePoint Application Development subject. The May MOOC starts on the 9th of May, a course description and enrollment form are available here. In June this year, Windows Expert-IT Pro MVP Erdal Ozkaya and our most experienced industry lecturer Steve Zobrist will be running a MOOC based on the first exam in the MCSA: Windows Server 2012 certification. We are still working out what will be covered in this course but if you register here we will send details as they become available. Over 85,000 people hold the world’s most in demand IT security certification; the Certified Information Systems Security Professional (CISSP). We already offer a subject designed to help prepare you for CISSP certification, and in July we will also offer a free CISSP preparation short course that covers the first 4 weeks of subject ITE514 Professional Systems Security. This MOOC will be based on the new Agile Project Management subject that we are introducing. This will be a MOOC designed to help you prepare for the new Cisco CCNA certification that has just been announced. Nick Randolph: MVP Microsoft Mobile Platforms – will run a MOOC based on the first weeks of the subject ITE508 Developing Windows Applications for the Web. A MOOC designed to help you prepare for the world’s most difficult and prestigious technical IT certification – the Cisco Certified Internetworking Expert (CCIE). The MOOC will show you how to prepare for both the CCIE certification exam and the infamous CCIE Lab exam. Are there other MOOCs you would like to see us offer? Please email your suggestions to admin@itmasters.edu.au. Nick Randolph: MVP Microsoft Mobile Platforms. Nick ran our first Free Short Course / MOOC on Windows Phone 8 Development, and is currently running the Developing Applications for Windows Phones and Mobile Devices subject that he developed. He has helped hundreds of developers build their own Windows Phone applications and we are looking forward to seeing the Windows Phone Applications that students are building as part of ITE517. Erdal Ozkaya: MVP Windows Expert-IT Pro. When I first met Erdal it quickly became apparent why he regularly wins Best Speaker at Microsoft TechEd Trade shows around the world. His enthusiasm is infectious and we think he will make a great Lecturer in our Windows Networking and Security subjects. Erdal is currently running his first subject Supporting a Network Infrastructure, and will be running a Windows Server 2012 MOOC later this year. In his ‘spare’ time Erdal has also enrolled in the Master of Networking and Systems Administration after which he is planning to commence a Doctor of Information Technology. Brian Farnhill: MVP SharePoint Server. Brian has just started work on developing our new SharePoint 2013 Application Development subject which he will be delivering later this year. Brian is passionate about helping customers get more value from their investments in SharePoint by extending the platform to meet specific customer needs. He works in most areas of SharePoint but specialises in web content management for both internal and external SharePoint sites, implementing businesses processes and workflow solutions, developing complex solutions, and helping to implement improved development and ALM processes for teams of developers working in SharePoint. We have also had a number of other MVPs volunteer to help as assistant Doctoral Supervisors for Doctor of IT students wanting to research Microsoft platforms. Having access to pool of industry gurus has been fantastic and I would like to put in a REALLY BIG word of thanks to the MVP Community Program Managers Veronica Mandich and Roseanne Stamell for putting us in touch with the MVPs. Q: What prompted you to decide to study at CSU? A: I decided to study at CSU, and in particular the IT Masters Program after hearing about it at a number of IT industry conferences. 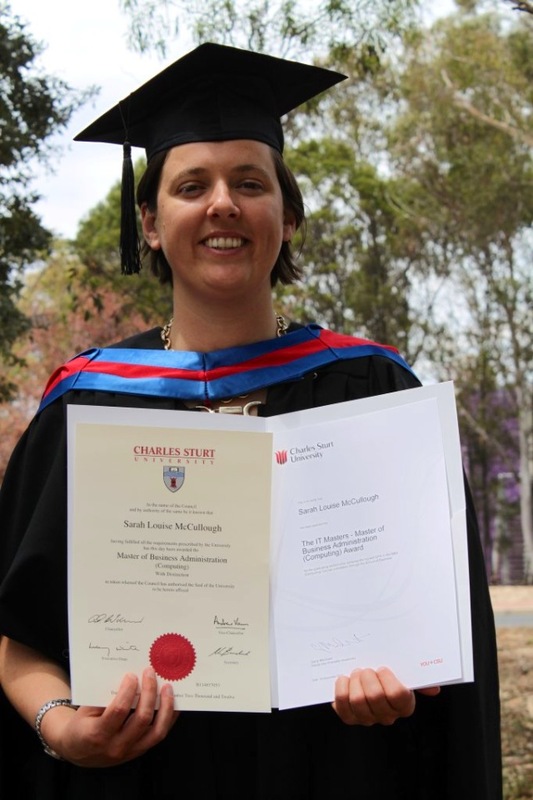 The flexibility of Distance Education offered by CSU meant that I could juggle family life, a busy job and my studies. A: I am currently the Asciano IT Service Delivery Manger for NSW. Asciano is Australia’s largest national rail freight and port operator – incorporating Pacific National and Patrick. My job certainly keeps me busy, but I love the challenge. Q: Has the course had any effect on your career path? A: It feels like I’m still recovering from the buzz of exams and graduation so my current career path hasn’t altered as yet. However the course has already provided me with valuable tools and skills to be more effective and efficient at my current role, and I have no doubt it will put me in very good stead for future roles I apply for. Q: What was the biggest challenge you faced in completing your study? A: For me personally, the greatest challenge was overcoming my self belief that I was not a capable student. I left University the first time around in the 5th year of a double Commerce / Law degree at ANU, and have avoided study like the plague since! Completing and succeeding in my degree at CSU has given me back the confidence in my abilities that I lost the first time around at uni. Q: What drove you to achieve such outstanding results? A: Studying something that I am passionate about, that has real world relevance and applicability was really motivating, and I believe made the difference for me. It also helped having lecturers who were attentive and available for the times when I felt a bit stuck. A bit of a competitive nature also probably played a part! Q: Which subject did you find the most rewarding? A: I found FIN571, Managerial Finance, both the most difficult and the most rewarding subject in the course. Commercial acumen is a key skill that I think will become more relevant in IT careers, and this course laid a great foundation. I also really enjoyed IT Ethics and Strategic Management. A: I was attracted to CSU because of the distance education options. Also, CSU is a well respected university both within Australia and overseas. Q: Can you give a description of your current job. A: I currently work within agri-insurance, specifically in training and development. A: Absolutely. I have been able to shift into project work smoothly and can legitimately contribute to those projects from a management perspective. I have the confidence to back my decisions thanks to my working knowledge of PM fundamentals. Since graduating I’ve been accepted to do a Master of Landscape Architecture. My project management skills will no doubt be invaluable both during my study and career in this new field which is really exciting. A: Early on it was remembering how to study again! 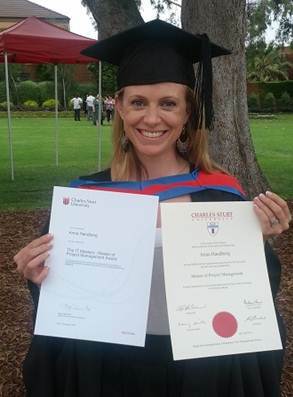 With over 7 years between undergrad and postgrad I had to work hard to remember what it takes. I found I needed to work smarter not harder as I balanced full time work often with two subjects. This was stressful but actually a blessing as after a few subjects I found I was far more efficient with my time management. A: I actually had not focused on my results until I found out I had done so well. I think for much of the degree I was focused on getting through each subject individually rather than the overall degree. I felt like I almost didn’t have time to come up for air and see how I was going overall! I just took each subject at face value, one at a time and tried not to get overwhelmed by worrying about the degree as a whole. A: I have to say the Financial Management subject. I was terrified of it, and knew it was coming up. Having a science background I had not done any in depth business subjects before. I hit the ground running out of fear and worked the hardest I had for the entire degree. To my surprise the hard worked paid off and I actually understood the subject! I ended up enjoying (as much as you can in finance!) the subject and did the best out of any of my subjects. Greg Paynter is a Doctor of Information Technology student who is investigating the impact of Over The Top (OTT) delivery film and television across the internet in Australia. His work is focused on how the Internet is quickly emerging as a distribution medium with the potential to challenge traditional film and television industries and consumers’ engagement with content. The first study, undertaken in September 2012, explored consumers’ perspectives of the OTT phenomenon, their understanding, interest and concerns, with a focus on Policy, Legislation and Law, The promise of Content, The Australian Market and Internet Video Technologies. 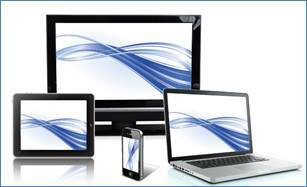 Findings of the study have been published in the current edition Vol 63, No 1 (2013) of the Telecommunications Journal of Australia, entitiled “ANY SCREEN, ANYWHERE, ANY TIME,” IS THE CATCHPHRASE OF THE OTT INDUSTRY, BUT ARE AUSTRALIAN CONSUMERS READY FOR THIS NEW PARADIGM? Greg’s study is available to read here. Fill out the online form at Am I Eligible? and we will get back to you with answers to these and any other questions you may have.